Wrinkles, folds, and creases around the mouth and lips are common concerns of patients who come to my office in Aliso Viejo. Fillers such as JUVÉDERM® and Restylane® are excellent treatments for lip lines, while BOTOX® Cosmetic helps smooth wrinkles. Most people begin noticing these lines in their early to mid-40s. Much deeper lines form during and especially after menopause. A lot of people believe smoking or drinking from a straw causes lip lines. Although these are contributing factors (especially smoking!!! ), I often see patients with very deep lines who have never smoked and rarely drink from straws. So, what is the cause? Often, it’s aging, sun-damage, and communication. Just like when we were teenagers, hormones again affect our skin as we age. Aging causes hormone levels to fluctuate and the overall loss of hormones (estrogen and progesterone in particular).The lack of hormones causes us to lose collagen, fatty tissue support, and (something most people don’t realize) the simultaneous loss of bone around the mouth. Yes, bone loss around the mouth has a tremendous impact on lip lines as we get older. The loss of bone, collagen and fatty tissue support, our lips slowly lose their curvature, extending from our nose to the red portion of the lips. The changing lip curve occurs imperceptibly over the years and isn’t noticed until pointed out in photographs. The change causes more muscle tension and tone in our lips and more effort to enunciate words. That is, we purse our lips more when we speak and close our mouth. For example, simply saying the number “two” in a mirror can illustrate the degree of pursing you perform throughout the day. The more you purse (when communicating), the deeper the lines gradually become and, if you think about it, that’s much more time than we spend drinking from a straw. Solutions are definitely available. Besides the dermal fillers mentioned earlier, laser skin rejuvenation with the ActiveFX™ fractional laser provides a more permanent solution to smooth even the deepest lines. Some lines only require laser, while others benefit from fillers, BOTOX, or a combination of the two. 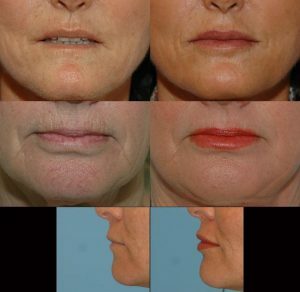 To see what treatments will be your solution to lip lines and wrinkles, a consultation is the first step.